The Arms of the Barony of Dun Carraig are blazoned "Per chevron gules crussily bottony and argent, a cross bottony within a laurel wreath gules." Its design is derived from a part of the flag of Maryland. Maryland's state flag reflects the arms of the Calvert and Crossland families. Calvert's arms are vertical bands of black and gold, with a counterchanged diagonal bar across them. Crossland's are a quartered field of red and white, with a large cross bottony overlaying where the quarters meet. Alicia Crossland, mother of George Calvert (the Lord Baltimore) was the only heir to her noble father and therefore able to bear her family's arms quartered with those of her husband. These arms were used as a symbol of Maryland since 1600, and was adopted as Maryland's state flag in 1904. Maryland is the only state that has truly heraldic arms. Dun Carraig's arms use design elements from the arms of Crossland. Above you can see a picture of Dun Carraig's thrones and heraldry as setup for Baronial Court at one of our Baronial Birthdays. The thrones are Viking style X chairs hand carved of mahogany, with the seats and backs of leather which was also hand tooled. Dun Carraig's thrones have won several Arts & Sciences awards for the artisans who created them. 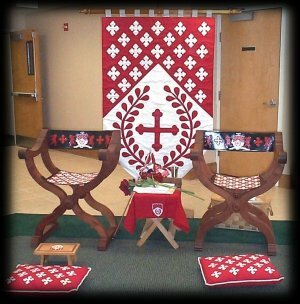 The heraldry behind them is made of raw silk, and is also hand sewn. The Badge of Dun Carraig is a Sea Dog, a fantastic creature composed of a dog's body covered with scales, possessing a club like tail, and having fins like a fish. Sometimes, the Sea Dog is represented with floppy ears (like a Talbot), or with spiny fin like ears (like the Creature from the Black Lagoon). Some heraldic researchers believe that the Sea Dog was based on early descriptions of a beaver. Since Dun Carraig is surrounded by the Potomac and Patuxent Rivers, as well as the Chesapeake Bay, this maritime creature was chosen as our symbol. The badge is blazoned "(Fieldless) A Sea-dog rampant to sinister gules."